In 2014, Alaska tribes won a lawsuit against the Department of the Interior (DOI) for the right to put land into trusts, expelling the “Alaska exception”. Land into trust is a process in which tribal organizations can request specific land be exempted from taxation and local zoning laws, and protected from proceedings such as eminent domain or foreclosure. It essentially keeps the land in tribal ownership permanently. DOI officials are talking with tribes across the state in a series of consultations this summer to reconsider land-trust rules in Alaska. 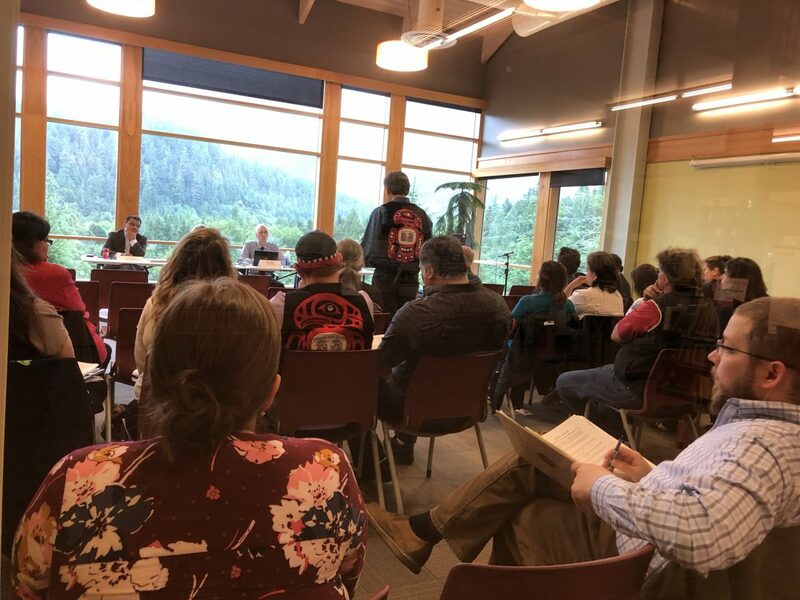 Matthew Newman, an attorney with the Native American Rights Fund representing the Village of Saxman, was one of many people who attended the latest consultation Friday afternoon at the Ketchikan Public Library. Newman said DOI has not been clear with the purpose of these consultations. Newman said many tribal leaders at the consultation perceive these meetings as an attack on their rights that they won just recently. Only the Craig Tribal Association has been able to put land into trust since the 2014 decision. The association put about one acre containing the city’s town hall and offices into trust in early 2017. Craig Tribal Association President Clinton Cook Sr. said one of the reasons land-trust rules should remain in place is their association has proven it can work in Alaska. “We knew there was going to be hurdles to come across. We overcame that hurdle, we’re very, very proud of that accomplishment and we look forward to see other tribes in Alaska to put lands into trusts,” Cook said. Jacqueline Pata from Tlingit and Haida Indian Tribes of Alaska also attended the Ketchikan consultation. She says like many tribes in the Lower 48 who have been able to put land into trust for decades, tribes in Alaska and Southeast simply want to protect their land for the future. “These are our lands, we don’t want to lose them from alienation in any form. We want them to be identified as tribal lands. And as we move forward in the future, they’ll be protected for future generations,” Pata said. Pata said she hopes DOI will take this feedback and maintain the land-trust program throughout Alaska. Until that decision, she says it is a waiting game to see what DOI does with this feedback. The next DOI consultation on the land-trust program in Alaska will be held in Anchorage in late October.